Projected growth in construction market, upcoming new hotels & shopping malls coupled with growing government spending on infrastructural development projects and increasing inflow of FDI in construction and retail sectors are some of the key factors that have resulted in the overall growth of elevator & escalator market in Australia & New Zealand (ANZ). In ANZ elevator & escalator market, the elevator segment accounted for majority of the market revenue owing to high installation of elevators in retail and residential verticals. However, escalator segment is projected to grow at a higher CAGR during 2017-23, primarily due to growth in airports, metros and railway development projects in the region. According to 6Wresearch, Australia & New Zealand elevator & escalator market is expected to grow at a CAGR of 4.4% during 2017-23. In last two years, Economic slowdown, decline in export revenues and government infrastructural development projects coupled with the depreciating currency in ANZ have affected the demand for elevators and escalators in the region. However, during the forecast period, market is expected to witness higher growth rate due to increasing FDI and infrastructural development projects. Amongst all verticals, commercial vertical acquired highest revenue share of the market pie in the region. Over the next six years, residential vertical is forecast to grow at higher CAGR during 2017 to 2023. In ANZ region, Australia held major market for elevator & escalator systems in terms of revenue, on the back of increasing infrastructure development activities, especially in commercial and residential verticals. However, over the next six years, New Zealand elevator and escalator market is expected to witness higher growth rate. The report thoroughly covers the market by elevator & escalator types, by verticals, by services and by regions. The report provides unbiased and detailed analysis of the on-going trends, opportunities/ high growth areas, market drivers, which would help stakeholders to device and align market strategies according to current and future market dynamics. • Historical data of Global Elevator and Escalator Market for the Period 2014-2016. • Market Size & Forecast of Global Elevator and Escalator Market until 2023. • Market Size & Forecast of Australia Elevator and Escalator Revenue & Volume Market until 2023. • Market Size & Forecast of New Zealand Elevator and Escalator Revenue & Volume Market until 2023. • Historical data & Forecast of Australia Elevators Market Revenue & Volume for the Period 2014-2023. • Historical data & Forecast of Australia Escalator Market Revenue & Volume for the Period 2014-2023. • Historical data & Forecast of Australia Elevator and Escalator Market Revenue, By Region for the Period 2014-2023. 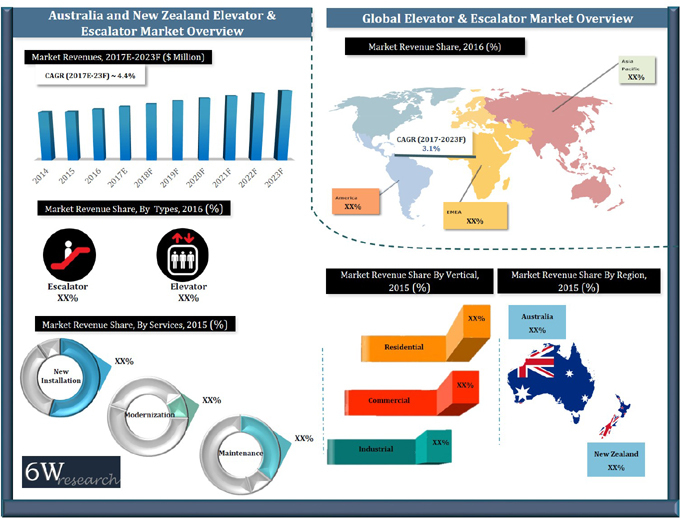 • Historical data & Forecast of New Zealand Elevators Market Revenue & Volume for the Period 2014-2023. • Historical data & Forecast of New Zealand Escalator Market Revenue & Volume for the Period 2014-2023. • Historical data of Australia and New Zealand Elevator and Escalator Vertical Market Revenue for the Period 2014-2016. • Market Size & Forecast of Australia and New Zealand Elevator and Escalator Vertical Market Revenue until 2023. • Historical data of Australia and New Zealand Elevator and Escalator Service Market Revenue for the Period 2014-2016. • Market Size & Forecast of Australia and New Zealand Elevator and Escalator Service Market Revenue until 2023.